Arsenal wonderkid Emile Smith Rowe is the talk of Twitter tonight as fans go wild for the teenager after yet another goal for the first-team. 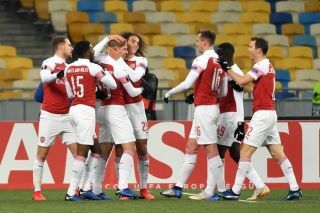 The 18-year-old made a real impression once again for the Gunners after being given the chance by manager Unai Emery, scoring in tonight’s win over Vorskla Poltava. This is Smith Rowe’s third goal at senior level for Arsenal, and while that record is impressive in itself, it’s also clear from watching the youngster just how talented and intelligent a player he is for his age. These Gooners below seem convinced Smith Rowe is the next big thing in the Premier League, with the England Under-19 international winning over these supporters after just a few appearances in the first-team. Emile Smith-Rowe is the future of the EPL. Kid is insane. Smith-Rowe is a special talent. I've been keeping an eye on Emile Smith-Rowe's progress for a while now. England have so much young talent coming through but I think this guy is the best of the lot. Emile Smith Rowe is definitely one for the future. Won't trade Emile Smith Rowe for anything #PROSPECT One for the future. Emile Smith Rowe, a bright future awaits. Another slight wage bump and extension next summer probably.